Employment was little changed in February (+15,000). The unemployment rate declined by 0.1 percentage points to 5.8%. On a year-over-year basis, employment grew by 283,000 or 1.5%. All of this increase was attributable to gains in full-time work (+283,000 or +1.9%), while part-time employment was unchanged. Over the same period, hours worked rose by 3.2%. In February, employment increased for both men and women in the core working age group (25 to 54), while there was little change for youth aged 15 to 24 and for people aged 55 and older. Employment increased in New Brunswick and Nova Scotia, while it decreased in Saskatchewan. There was little change in the other provinces. Employment gains were observed in several industries, led by health care and social assistance. At the same time, employment declined in a number of other industries, including wholesale and retail trade, and manufacturing. The number of employees increased in the public sector, while it held steady in the private sector. The number of self-employed workers decreased. Among the core-aged population, employment rose by 41,000 (+0.3%) in February. Increases were similar for both men (+22,000 or +0.3%) and women (+19,000 or +0.3%). The unemployment rate for the core-age group was 4.9% for the third consecutive month. On a year-over-year basis, the unemployment rate for core-aged men and women was down 0.6 percentage points. Over the same period, employment for core-aged men increased by 99,000 (+1.6%), while it was virtually unchanged for women in this age group. Employment was little changed for both men and women aged 55 and older. The unemployment rate among older women fell by 0.3 percentage points to 4.3%, while it was little changed for older men at 5.7%. Compared with 12 months earlier, employment in this age group increased by 111,000 (+6.5%) for women and by 48,000 (+2.3%) for men. For youth aged 15 to 24, both the level of employment and the unemployment rate were little changed in February. On a year-over-year basis, their unemployment rate declined by 1.3 percentage points to 11.1% as fewer youth searched for work. Employment increased by 5,100 (+1.5%) in New Brunswick in February, driven by gains in full-time work. The unemployment rate fell 0.9 percentage points to 8.2%. On a year-over-year basis, employment in the province was little changed. In Nova Scotia, employment rose by 2,800 (+0.6%), entirely due to increases in full-time work. The unemployment rate was little changed at 7.9%. Compared with 12 months earlier, employment in the province increased by 10,000 (+2.3%). 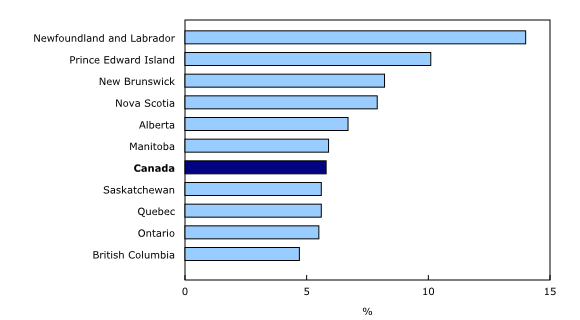 Employment fell by 2,900 (-0.5%) in Saskatchewan, and the unemployment rate was 5.6%. On a year-over-year basis, employment declined by 8,200 (-1.4%). 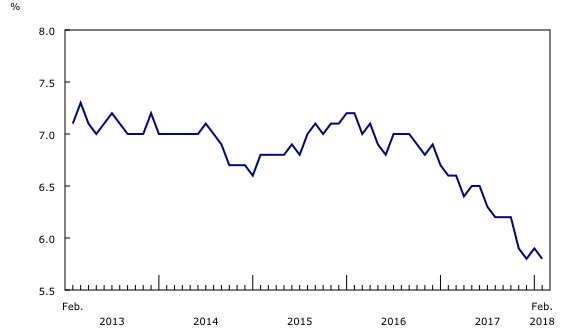 Overall employment in British Columbia changed little in February, as full-time declines were mostly offset by part-time increases. On a year-over-year basis, employment in the province rose by 40,000 (+1.6%), entirely due to increases in part-time work. In both Ontario and Quebec, employment was little changed in February. The unemployment rate was 5.5% in Ontario and 5.6% in Quebec. 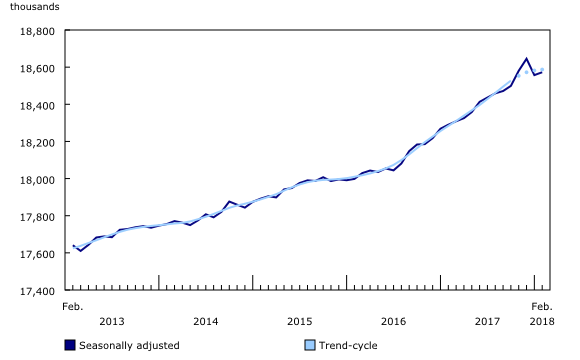 Compared with 12 months earlier, employment was up by 114,000 (+1.6%) in Ontario and by 74,000 (+1.8%) in Quebec. Meanwhile, the unemployment rate fell by 0.7 percentage points in Ontario and by 0.8 percentage points in Quebec. Employment in health care and social assistance increased by 25,000 in February. Compared with 12 months earlier, employment was little changed. In the "other services" industry, employment rose by 17,000 in the month, but was little changed on a year-over-year basis. "Other services" include services such as repair and maintenance. Continuing an upward trend that began in early 2016, the number of people employed in transportation and warehousing increased by 13,000 in February. Compared with 12 months earlier, employment in this industry grew by 48,000 (+5.1%). Employment increased by 12,000 in educational services, while it changed little compared with February 2017. In public administration, employment rose by 9,000 in February, little changed from 12 months earlier. There were 7,600 more people working in natural resources in February, bringing year-over-year employment growth to 11,000 (+3.4%). Employment in this industry has been trending upwards since the second half of 2016. Employment in wholesale and retail trade declined by 22,000 in February. Despite this decrease, employment was up 36,000 (+1.3%) on a year-over-year basis. In manufacturing, employment declined by 17,000 in February, but increased by 71,000 (+4.2%) compared with 12 months earlier. The number of people working in professional, scientific and technical services was down by 12,000. On a year-over-year basis, there was little change in employment in this industry. The finance, insurance, real estate, rental and leasing industry saw a decrease in employment of 12,000 in February, but no change from 12 months earlier. The number of public sector employees rose by 50,000 in February, following a decline in the previous month. The number of private sector employees was little changed. On a year-over-year basis, the number of employees increased in both the private (+99,000 or +0.8%) and public (+92,000 or +2.5%) sectors. Self-employment declined by 43,000 in February. Compared with 12 months earlier, the number of self-employed workers increased by 92,000 (+3.3%). The Labour Force Survey (LFS) estimates for February are for the week of February 11 to 17. The next release of the LFS will be on April 6. A more detailed summary, Labour Force Information (Catalogue number71-001-X), is now available for the week ending February 17. To enquire about the concepts, methods or data quality of this release, contact Martha Patterson (613-299-3942; martha.patterson@canada.ca), Lahouaria Yssaad (613-951-0627; lahouaria.yssaad@canada.ca), or Client Services (toll-free: 1-866-873-8788; statcan.labour-travail.statcan@canada.ca), Labour Statistics Division.